1. A tool to perform a disappearing act for your Mac OS X top menu bar. MagicMenu is a set of freeware utilities that allows you to auto-hide the top menu bar in Mac OS X. It currently allows you to turn auto-hide on/off for each individual application (even the Finder). There is also a toggle utility for you to toggle auto-hide on/off for each application. The MagicMenu utilities supports drag-and-drop interface, so that you can drop individual applications onto the utilities or you can drop a bunch of applications at once to turn top menu auto-hide on and off. Use the following list to find the your favorite applications' locations. 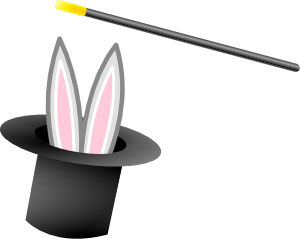 MagicMenu is a free software that you can use without any charge. So download away and use it to get more screen space. There is no support, no warranty, and no liability associated to MagicMenu of any kind. If you have questions regarding the MagicMenu, feel free to post and discuss them in our forum. Also, let us know what functionality you'd like to see in future versions of MagicMenu. MagicMenu 3.0 is now available. The current build is 2009-08-10. See Change Log. MagicMenu should work on both PowerPC and Intel platforms. After downloading the ZIP file above, double-click on the ZIP file in Mac OS X to create a MagicMenu folder in the same directory where you downloaded the ZIP file. You can move this folder anywhere you like (e.g. Desktop, Applications). The MagicMenu utilities are in this folder. Follow the description in the next section to use these utilities. Finder MagicMenu On: Because the Finder is always running, you can't drag-and-drop the Finder application onto one of the MagicMenu utilities below. Instead, double-click on this utility turns on the Finder's auto-hide feature. You'll have to reboot Mac OS X after performing this operation. Finder MagicMenu Off: Because the Finder is always running, you can't drag-and-drop the Finder application onto one of the MagicMenu utilities below. Instead, double-click this utility turns off the Finder's auto-hide feature. You'll have to reboot Mac OS X after performing this operation. Finder MagicMenu Toggle: Because the Finder is always running, you can't drag-and-drop the Finder application onto one of the MagicMenu utilities below. Instead, double-click this utility to toggle the Finder's auto-hide feature. You'll have to reboot Mac OS X after performing this operation. MagicMenu On: This utility turns on the auto-hide feature to applications that are dragged-and-dropped onto it. If you drag-and-drop a folder, it will ask you whether to change MagicMenu settings for all applications within the folder. It might take MagicMenu quite a long time to process everything if you dropping a huge folder with lots of sub-folder onto this utility. MagicMenu Off: This utility turn off the auto-hide feature to applications that are dragged-and-dropped onto it. If you drag-and-drop a folder, it will ask you whether to change MagicMenu settings for all applications within the folder. It might take MagicMenu quite a long time to process everything if you dropping a huge folder with lots of sub-folder onto this utility. MagicMenu Toggle: This utility toggles the auto-hide feature to applications that are dragged-and-dropped onto it. If the application has MagicMenu turned on, then it is turned off, and vise-versa. If you drag-and-drop a folder, it will ask you whether to change MagicMenu settings for all applications within the folder. It might take MagicMenu quite a long time to process everything if you dropping a huge folder with lots of sub-folder onto this utility. MagicMenu Library: This library contains a set of code that are shared by the MagicMenu utilities. It is not an user-executable module. MagicMenu works by updating the application's info property list (Info.plist). Before making changes, the MagicMenu utilities makes a backup copy of the original Info.plist file. The backup copy is stored in the same directory as the original "Info.plist" file, under the new "Info.MagicMenu" name. It only creates this backup file if it doesn't exist already. Keep in mind it only backs up the original file once, the very first time you use MagicMenu on an application. It doesn't do it every time you run MagicMenu on that application. Apple started code signing all applications on Leopard (10.5). If you use the MagicMenu utilities on your applications, those applications' digital signature will become invalid, which means they will not have access to Keychain. So it is fine to use on non-password-oriented applications or if you don't use Keychain functionalities at all. This Keychain access issue only applies to Mac OS X 10.5 and newer. See "Related Links" below for work-arounds. SpotLight doesn't work in Finder, but works in other applications. One work-around is to turn MagicMenu off for Finder, but turn MagicMenu on for other applications.